Check out how many calories in Roasted Cabbage and Carrots. Get answers to all your nutrition facts questions at FitClick. Tip: For nutritional information on all the ingredients in Roasted Cabbage and Carrots just click on each ingredient name. Then adjust the serving size for any Roasted Cabbage and Carrots ingredient with the serving size tool in the nutrition facts area to the right to see how you can save calories, carbs and more. Preheat oven to 375 degrees. 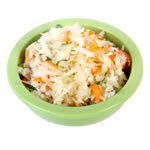 Cut cabbage into small wedges and carrots into pieces. (cut large pieces in half lengthwise.) Place in single layer on baking sheet and drizzle with oil. Salt and pepper to taste. Bake in 375 degree oven, turning once or twice, until crisp tender. Find more recipes like Roasted Cabbage and Carrots. FitClick has over 60,000 foods and recipes with detailed nutrition information to view.